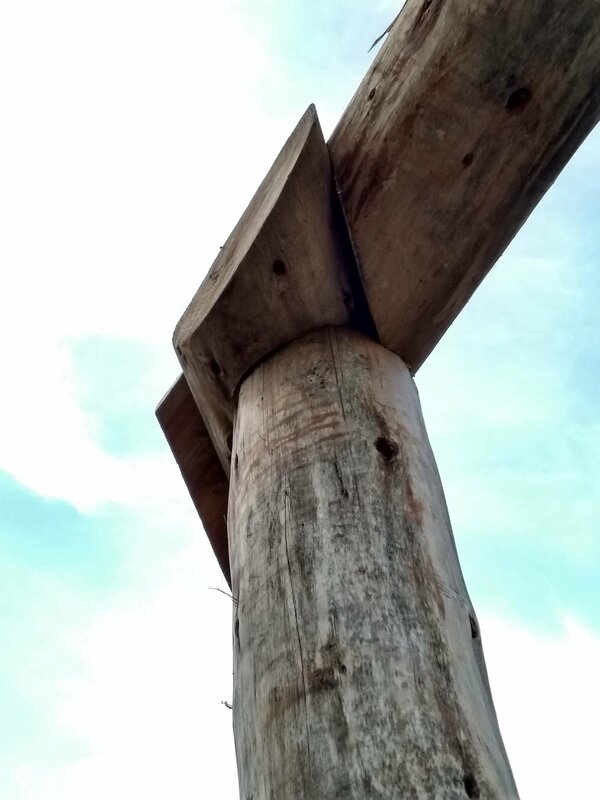 During the month of September an extraordinary wooden structure emerged from the landscape to sit beautifully in the meadow at Round the Woods and it really is quite a spectacle. 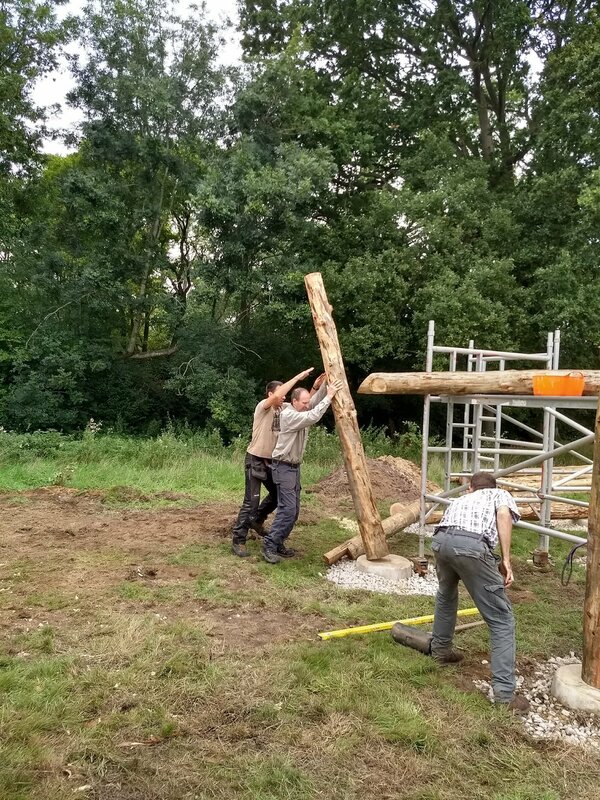 Now, we're not ones to shy away from a challenge and are excited to have quite a few learning opportunities in the pipeline as part of this project but we decided to call in the experts to construct the core elements of the structure for our straw bale roundhouse. 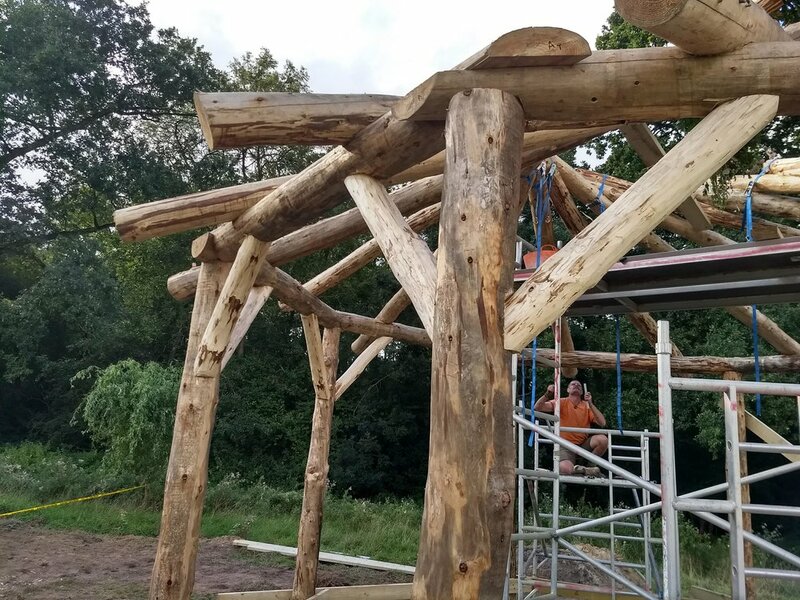 We enlisted the skilled mastercrafters at Artizans of Wood for this crucial stage as well as providing a watertight sedum roof for the roundhouse. 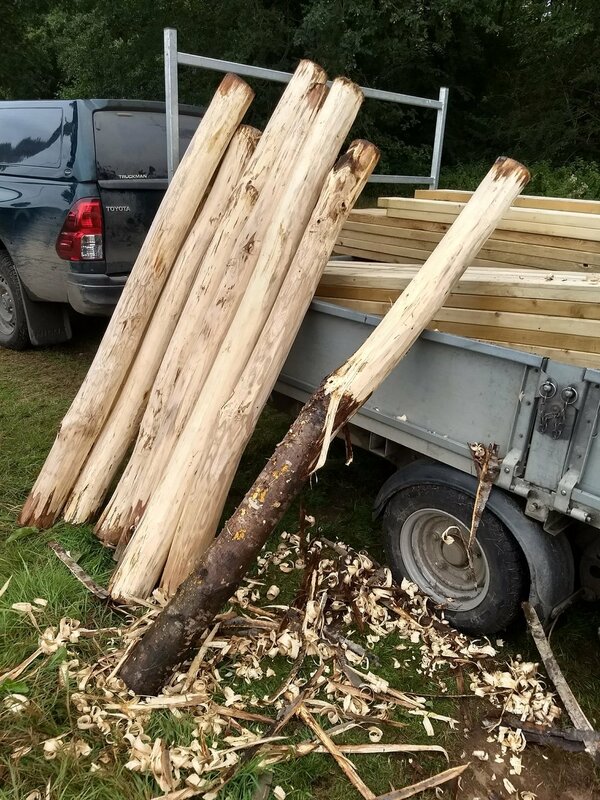 We knew we'd chosen the right people for the job when Dylan and Paddy from Artizans of Wood came for a site visit all the way from the South Downs towards the end of winter. And boy were they a great resource to have at the end of the phone as well as being extremely patient while we navigated our way through the rather complex building regulations and design process. They've built an impressive collection of inspiring structures over the last few years, all with beautiful wood taking centre stage. Luckily they were up for a challenge with our project as it was a first in two ways for them - their first roundhouse that met with building regulations and their first roundhouse with a green roof. 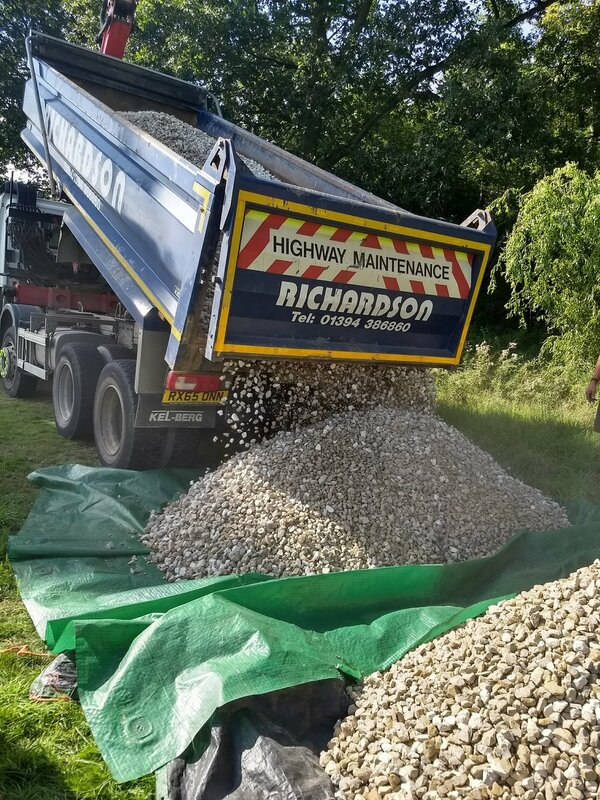 Plus they typically work within a few miles of their South Downs site and we were dragging them all the way up to Norfolk for our build, which presents it's own challenges with having to transport everything and spend time away from their families. 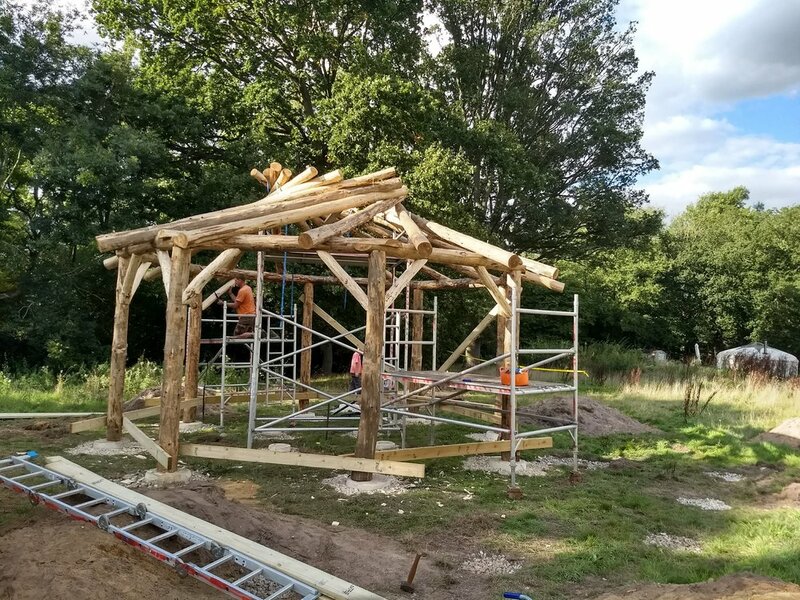 In the summer we were able to present Artizans of Wood with the final designs and they promptly started work preparing the frame at their Sussex site. 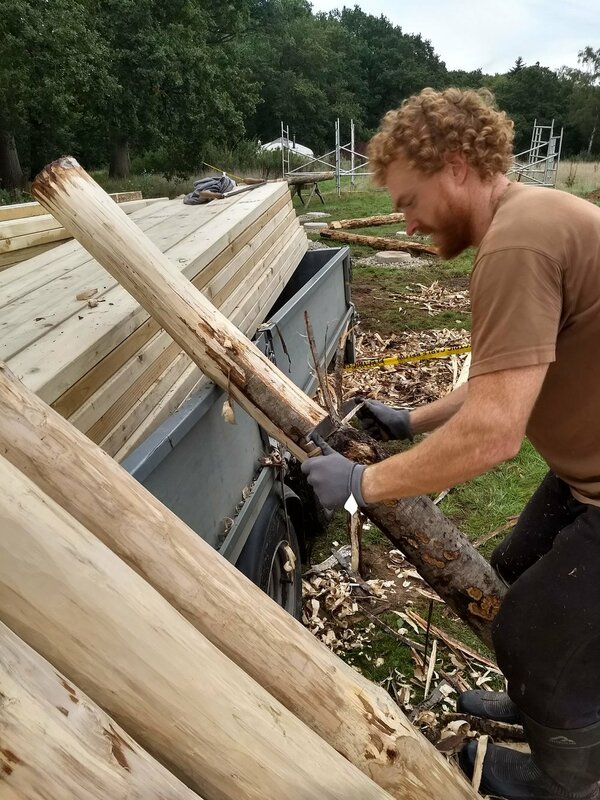 Then in the beginning of September Dylan and Paddy brought the larch roundwood frame in individual debarked tree trunks to Round the Woods and prepared the foundations. 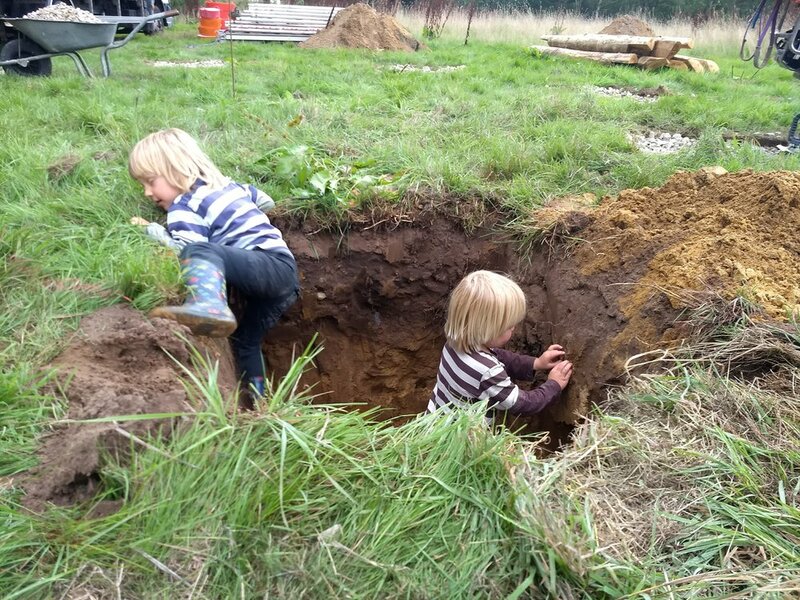 We want our whole site to be low impact and so this ruled out the more conventional concrete foundation option. Instead we worked with our structural engineer, Elise at Archibald Shaw, to find an alternative that would meet building regulation requirements. We went for compacted gravel with a padstone to hold each of the frame posts. Our trusty JCB digger came in handy with Paddy at the helm digging the 15 foundation pits. The following week Artizans of Wood brought a larger team of 4 guys to our site to erect the frame and begin building the roof. 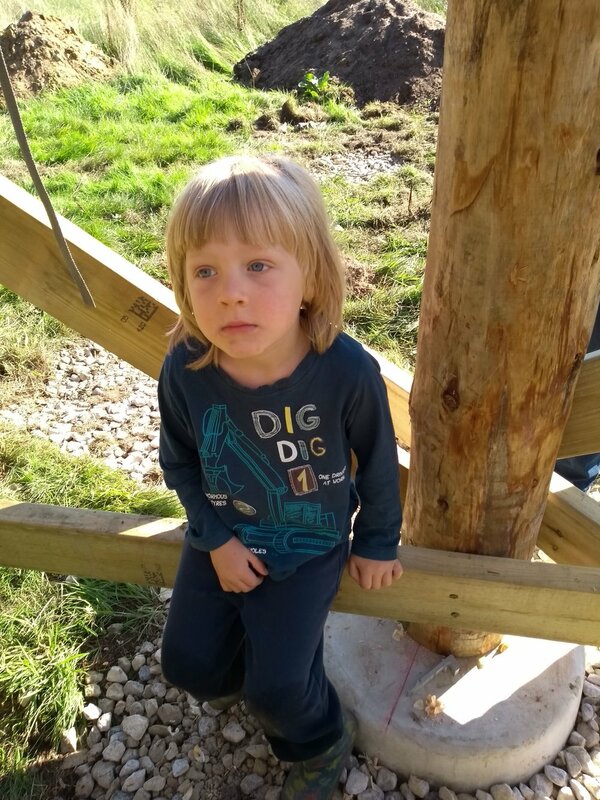 They camped alongside our orchard with Paddy and Dylan bunking up together in Paddy's loosely pegged bell tent, Nick had the luxury of a teepee with a little woodburner inside and Andy camped out in his van. There’s something quite magical about the natural build process and it’s been wonderful to experience first hand. 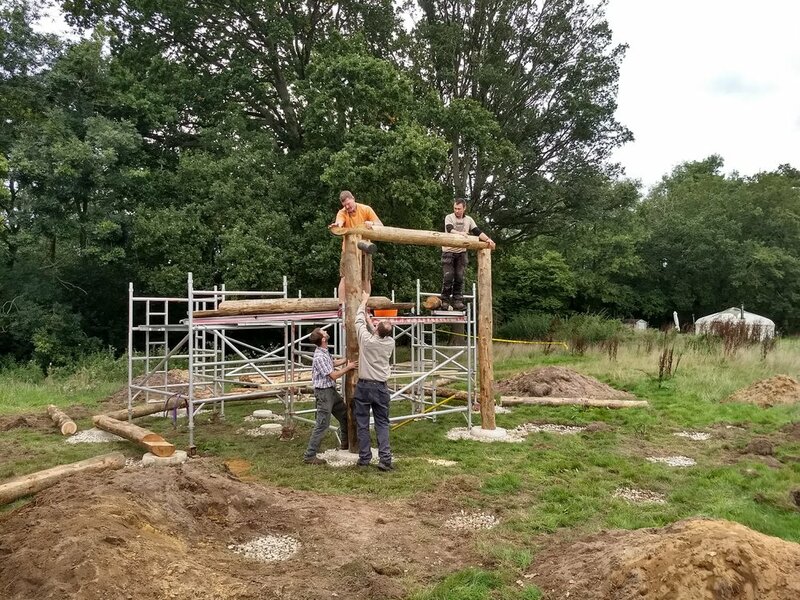 The frame raising took the team just one day with a woodhenge seemingly growing out of the ground. Once the roundwood rafters began to be added it very quickly transformed the frame into a more defined structure. The first rafter was temporarily supported with a central frame and each subsequent rafter was rested on top of the one before. As the final rafter was positioned under the first, a bouquet of foliage gathered from our land was tied at the top to ward off evil spirits. 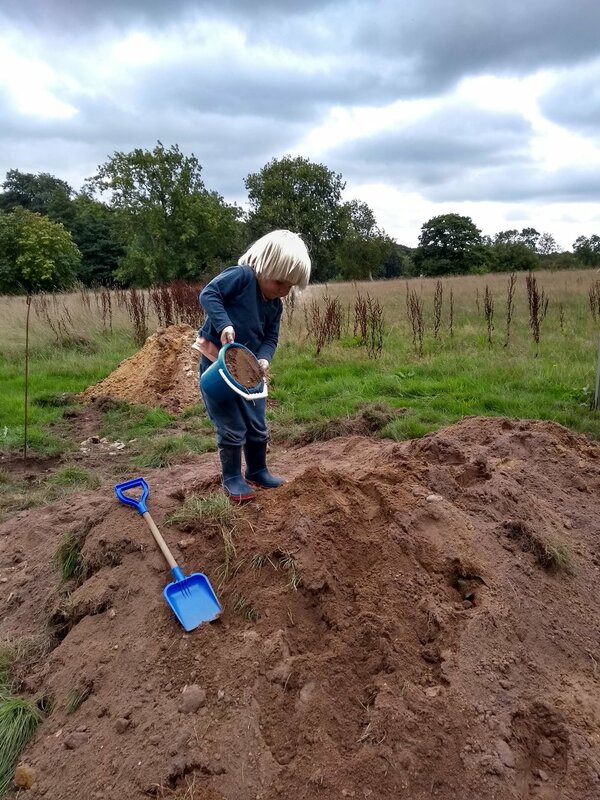 It contained Oak and Willow branches from the trees directly behind the roundhouse, nettles, dandelions, raspberry canes full of fruit and a small branch from our Wild Cherry Tree which was planted in memory of Sebs dad who sadly left us in 2016. 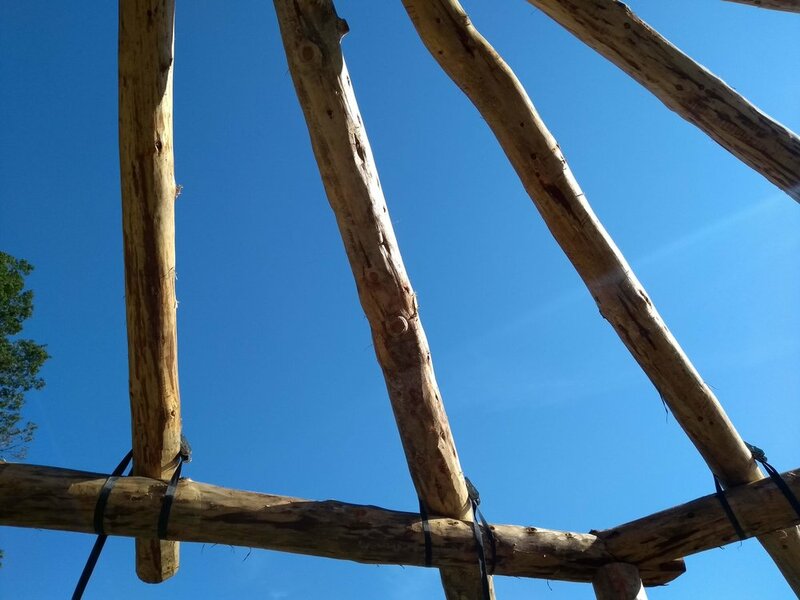 To give you an idea of how the frame and reciprocal roof were constructed in roundwood we thought we’d share lots of photos with you of this magnificent structure. It really was an honour to watch them working together and to have them add their own creative ideas and solutions to the challenges that this build presented along the way. Keep an eye out for the next blog update which will cover the many layers to the finished sedum roof.